Yes, I'm still considering Italian as a language, don't worry! I would post here but the pictures are too big, it would be hard to read without them, so I invite you to read the article on my site! My adventure game requires your help! Despite a good ratio of yes votes, a successful Kickstarter and very positive feedbacks, it didn't get a lot of views on Steam Greenlight on the first days and is now getting stuck in the ranking. It seems it's sometimes difficult for adventure games to pass, not the favorite genre of gamers. Thank you very much for the vote! Every vote is a real help now! I'll consider other languages translations if we get past these two stretch goals! 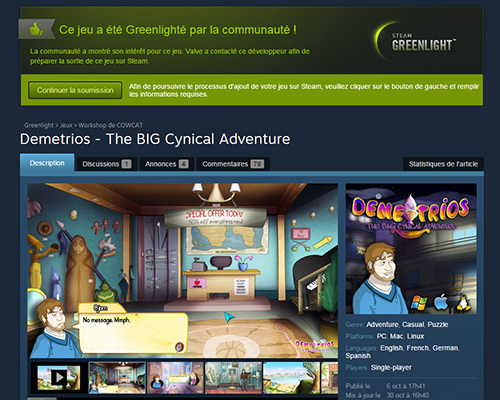 Good news, Demetrios got greenlit today and thus will be available on Steam! (with achievements, cards and probably support for saves into the cloud). The Steam version will be an option of course, there will also be a DRM Free version available. There are still 7 days left to support the Kickstarter! The Spanish translation stretch goal has been reached, the next ones are the German translation (3 500 €) and the PS Vita version (5 000 €) which unexpectedly was the most requested console version! 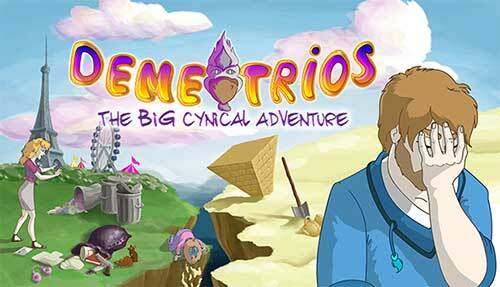 Only 48 hours left to support Demetrios on Kickstarter! I've shared a new screenshot from the game in my latest update Oh and the German translation stretch goal has been reached too! Can we reach the PS Vita port before the end? As for an Italian translation... Well, let's just say there's a high probability it will happen More about that soon! COWCAT ha scritto: As for an Italian translation... Well, let's just say there's a high probability it will happen More about that soon! This is quite a great piece of news! Two young professional translators (RuM Corp.se) have accepted to do it within my budget, and they're progressing pretty fast! They've translated some famous adventure games, so they'll probably do a great job! We know them and agree they'll do the best job. Good! The development of Demetrios is in the last stages, so I expect to release the game in a few months. Also, Demetrios now has cover art! Thanks for the update and for the good news about Italian translation. Ormai prossimo all'arrivo sugli scaffali digitali di tutto il mondo, Demetrios - The BIG cynical adventure si presenta con un trailer per avvisare tutti gli avventurieri del suo arrivo; in uscita anche su Zodiac Store il prossimo 31 maggio, questa simpatica avventura prevede fra le 8 e le 12 ore di gameplay, oltre che i (mai troppo lodati) sottotitoli in italiano. Thanks for the news! The Steam page is up! The game is fully translated into Italian and currently being proofreaded. Also, Cliqist has posted an article : "IRREVERENT ADVENTURE DEMETRIOS IS LIKE BROKEN SWORD ON CRACK"
Se siete curiosi di sapere cosa vi aspetta in Demetrios - The BIG cynical adventure, crediamo possa esservi utile visionare questo filmato di gameplay, proposto dallo stesso autore del gioco, in cui ci vengono mostrate atmosfere, interfaccia e una prima anteprima dell'approccio che vi verrà richiesto. Vi ricordiamo che Demetrios uscirà il prossimo 31 maggio, compreso di sottotitoli in italiano. The Demetrios demo is now available on Steam! And it's fully translated into Italian! Remember, Demetrios comes out in two weeks! 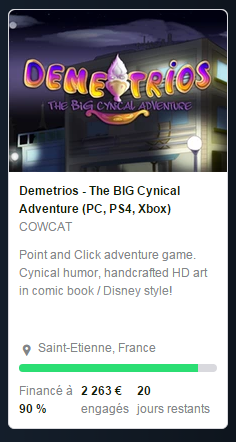 COWCAT ha scritto: The Demetrios demo is now available on Steam! And it's fully translated into Italian!